The Russian Povolzhye (Volga region) famine of 1921 began early that year and its impact was felt through 1924. It is estimated that this famine claimed the lives of 5 million people. The famine stemmed from both natural and human causes. There was a poor crop in 1920 which was made worse by the disruption of agricultural production, which started during World War I and continued through the disturbances of the Russian Revolution of 1917 and Civil War. The Bolshevik policies of War Communism (keeping the Red Army stocked with weapons and with food) and prodrazvyorstka (a campaign to confiscate grain and agricultural products) had set the stage for a human tragedy. Mass confiscation of stored grain began in the winter of 1920-21 triggering the beginning of famine in January 1921. In many cases recklessness of local administration, which recognized the problems only too late, contributed to the problem. Hunger was so severe that it was doubtful that seed-grain would be sown rather than eaten. Without seed to plant, the famine worsened in the spring of 1921 and people sold all they had to survive. Drought struck a hard blow to the Volga region in the summer of 1921 resulting in a total crop failure. With death all around, Cholera and Spotted fever were rampant. Family and friends in the United States received letters from Russia describing the terrible conditions. John Miller discussed the dire situation with his brother-in-law, George Repp. As a result the two men decided to take action to form a relief society in Portland, Oregon to provide aid to those suffering in Russia. European Relief Committee, 42 Broadway, New York City. There are approximately fifteen hundred people in Portland that came from German colonies located in Russia near city of Saratov along Volga River. These people are anxious to help get food into that stricken district of Russia. They have received letters from relatives appealing for help. Will you be good enough to wire us how to proceed. That is, can we send money to you and designate that it is to be spent for food for a certain colony. Also have you any idea when relief work and food distribution will begin in Russia. There will be a mass meeting Thursday evening among our people and a regular relief committee organized for German speaking colonies in Russia. We would like very much have your reply by then giving us all information you can that may help in the organization. Have hopes of extending the work of this committee to other places where our people are located in California, Washington, Idaho, Montana, Colorado, Dakotas, Nebraska, Iowa, and Kansas. We figure that there are in the United States approximately a hundred thousand people interested in these German speaking colonies along the Volga River and that good work can be done with proper help from a reliable source like yourselves. Would it be possible for us to send an American citizen of our people into these colonies in Russia through your committee? That is, be endorsed by you or even sent by you as one of your workers so that he would have proper protection. Miller received a positive response and two days later, on August 11, 1921 about one hundred men who were interested in the project gathered in the Zion Congregational Church of Portland, and voted to organize a relief society. The officers elected were: John W. Miller, president; David Hilderman, vice-president; George Repp, secretary; and John H. Krieger, treasurer, although Mr. Krieger resigned in the next meeting and was replaced by Mr. Gottfried Geist. 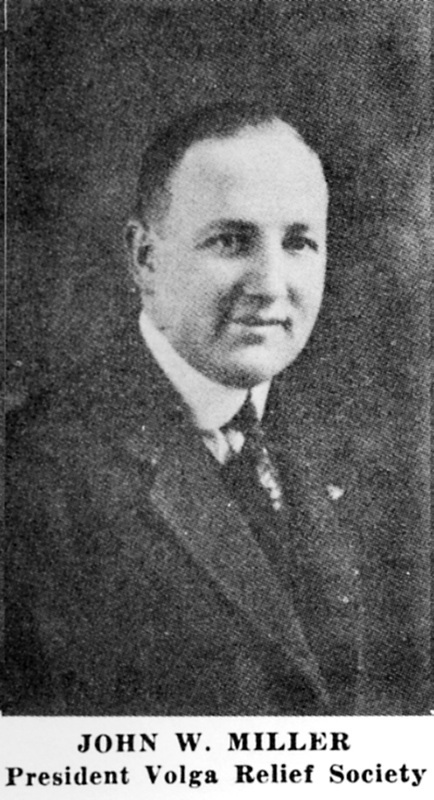 George Repp made the motion that the organization should be called the Volga Relief Society. George Repp was designated as the person who would represent the society in Russia through the ARA. The enthusiastic response of the Portland people to the news that an organization had been perfected was far greater than anyone could have believed possible. Throughout the following days the newly elected leaders were constantly being stopped by Volga German men and women who expressed their happiness in the creation of the society. In view of the seriousness of the crisis that existed in Russia, all religious and personal differences were forgotten, and people of all denominations and from all colonies showed a spirit of harmony and co-operation that was to remain truly remarkable. The future success of the Volga Relief Society can be explained to a great extent by the splendid loyalty of its members, which became an example for Volga Germans in many other communities of the States. Similar gatherings were held by Volga Germans living in Fresno, California and in Lincoln, Nebraska. Before long money was contributed by communities in Colorado, Washington, Montana, Oklahoma, Illinois, Kansas, and many other states in which the German-Russian people had settled. As a result of their efforts, more than one-million dollars was raised for their unfortunate compatriots in Russia. Historians have described the relief work accomplished along the Volga River during the years 1921-1923 as the most outstanding act of charity ever performed by the Volga Germans now living in the United States. Both John W. Miller and George Repp deserve much of the credit for this humanitarian effort. John William Miller was the son of Johannes O. Müller (John Miller), who was born on February 5, 1841 in Norka, Russia and Anna Elisabeth Giebelhaus who was born in Norka on June 6, 1850. The Miller family immigrated to the United States in 1887 and settled for a time in Sutton, Nebraska. By 1891, the family had moved to Portland, Oregon where John W. was born on June 4, 1891. John attended the Williams Avenue Grammar School from 1897 to 1905. While he was in the first grade his twin sisters gave him his middle name of William. After graduating from the eight grade, John W. took business courses and at the age of 16 was working as a stenographer for the wholesale lumber firm of Dant and Russell, which later became one of Portland's largest lumber companies. John left the company in 1912 and went to work as a salesman and trusted advisor to C.C. Crow. a lumber manufacturer. In 1915, John W. founded the Coast Fir Lumber Company along with a partner, Charles Putnam, who was a shingle manufacturer. Together they bought a shingle mill at Skamokaway, Washington. John's brother, George E. Miller, worked with John as a bookkeeper and lumber buyer. The lumber market went into decline at this time and the sawn shingles had to be sold at a loss, dooming the company. After Coast Fir Lumber Company went bankrupt, John started again in the wholesale lumber business under the name Coast Fir and Cedar Products Company. His second company failed in 1929 during the Great Depression when the lumber markets crashed. He then joined his brother, George, at his company until he could again start anew. ​John W. Miller died in 1944. Haynes, Emma S. A History of the Volga Relief Society. Lincoln, Neb. : American Historical Society of Germans from Russia, 1982. Print.